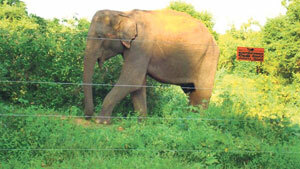 The human-elephant conflict is a serious problem that Sri Lanka has faced for many years. Increased rural habitation and resultant infringement of natural elephant territory has led to the wild beasts turning ferocious often destroying cultivated land and attackng innocent people leading to disability and more frequently, death. Unfortunately, this issue of national consequence hasn’t been adequately addressed by the authorities concerned due to several factors. A strong view coming forth in the debate over minimizing the conflict is the use of a non-lethal electric fencing which would both protect the animal and the affected people. Douglas Seneviratne, Managing Director Tecgate International (Pvt) Ltd is an authority on the subject, giving leadership to the largest Fencing and Solar power project in South Asia as the Project Manager. This was undertaken in a project funded by AIDAB (Australian International Development Assistance Bureau) and implemented through the Minister of Housing and Construction and the National Housing Development Authority in 1992. “Electric fences have been in usage for many years in the context of managing animals. These devices are designed to bring about a behaviour of avoidance once the animal comes into contact with the energized wires. The energizer delivers very high voltages in the form of pulses with stored energy capability of joule ratings varying from as little as 0.4 joules upto 56 joules to deter animals of varying body mass,” Mr Seneviratne said. “Electric fencing has evolved over the years resulting in safer devices and improved animal control in both grazing and confinement systems. However local authorities have not put the system to use due to the entailed expenses which are exorbitant,” he added. In a statement, Tecgate International said it has long understood the need for more affordable power-fencing solutions for Sri Lanka. This is in view of the rural communities that continue to suffer from wild animal threats, elephants being the most devastating hazard. “We have been engaged in electric-fencing for over a decade and we of the view that the amount of foreign exchange spent for most of the equipment could be reduced drastically through local manufacturing. Thereby the expenditure related to power-fencing can be significantly reduced, making the solution a more viable one for the protection of rural communities,” he said. In 2008 the Department of Wild Life ordered equipment to the value of Rs 100 million followed by Rs164 million the next year. However in the past eight years Tecgate International has imported just over Rs 8 million worth of equipment for fencing of smallholder individual farm lands to cover an extent of over 60 km of electric fencing, a distance of 150 km of electrified wiring. Projects completed by the company are functioning at peak efficiency. Accordingly an energizer has now been developed by Tecgate which is capable of meeting local needs and is also suitable in meeting the requirements of the international market. The equipment has been certified by the University of Moratuwa meeting all standard fencing parameter requirements. “We hope that the technology we have successfully developed for local manufacturing of energizers would be utilized properly. 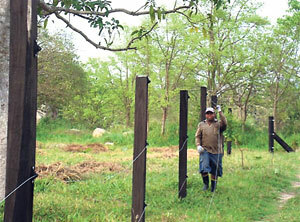 Cost-effective electric fencing is the only viable solution to this long-standing human-elephant conflict which has cost us many valuable lives and brought elephants in Sri Lanka dangerously close to extinction,” Mr Seneviratne added.